James G. Webster. 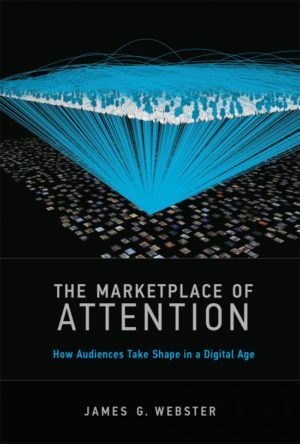 The Marketplace of Attention: How Audiences Take Shape in a Digital Age. MIT Press, 2014. 268 pp. The task of understanding media consumption today is fraught by endlessly-morphing means of distribution, ways of engaging, and abilities to co-create media content. To think that four decades ago, media consumption was led primarily by three television networks, local print newspapers, and a handful of national magazines! But even in that earlier era, methodological questions of how to best measure, quantify, and predict media consumption were debated and argued from a variety of perspectives, from social scientific to cultural and ideological. These different lines of inquiry produced useful models of committed audiences, but these models were also starkly divergent from one another. For just one example, the passive media user postulated by much media effects research is utterly irreconcilable with cultural studies’ socially- and culturally-aware viewer, who is capable of ‘reading against the grain’ of popular media. Rather than opening up old wounds in ways to conceive of the viewer, I want to remind readers of the considerable, and unresolved, challenges posed well before the digital era. Very few within the academy have even attempted to characterize the contemporary state of audience formation. James G. Webster’s book offers not just a way to sort, analyze, and assimilate the dizzying options in our current media environment, but an intervention in the field of media economics. Webster’s work is a clear, bold call-to-action for shifting media economics from defining ‘audience’ and ‘viewer’ to conceiving of a ‘marketplace for attention.’ As part of this project, Webster presents a 30,000 foot view on the media consumption experience. Even more impressive is his ability to chart the trajectory for media consumption, including a precise articulation of the multiple theoretical approaches from the past and a suggestion of what needs to occur to have a more flexible and reasonable model of the media experience moving forward. While Webster is certainly model building, he is shrewd to make these models as malleable as possible, the better to include a larger variety of media on the micro-level. It’s an accomplishment that the book, published in 2014, presents a model of media consumption that is essentially still applicable two years down the line. Minor yearly shifts in technology, distribution outlets, and audience preferences are easily accommodated within Webster’s framework. Clearly, the project is designed not to be an end point for a media model of audience but rather the starting point for a suggestive and pliable way to understand audience in the digital era. One of the real joys of Webster’s book is his strong and fluid writing. Webster is precise, clear, and declarative in his creation of arguments and in his rhetoric. Perhaps more surprising – though it is a lovely surprise – is the level of enthusiasm and fun that is so evident in Webster’s writing. A senior scholar in Communication at Northwestern University, Webster transparently relishes the project at hand. In fact, as a reader, it’s tough not to be transported by Webster’s excitement as he unravels the mysteries of audience. While many scholars have either ignored or retrenched over the rapid shifts brought on by digital media, Webster is inspired by the possibilities. He sees these macro-changes in content, marketing, and distribution as ways of shifting the dialogue around our understanding of the media audience. While Webster works on both a macro and micro level to sketch the current media audience, his characterization of the ‘big picture’ functioning and operation of media and audience is, by far, the most valuable asset of the book. Webster bolsters this perspective throughout, citing specific studies and trends in research, both academic and industrial, to target the media audience. These particular examples are useful, but Webster’s larger theorizing on the functioning and operation of media holds the key to the greatest contribution of this work. In fact, the larger framework offers a radical reconceptualization of the media industries. Further, this framework goes far beyond an understanding of the audience to sketch the dynamics and functions of the overall media environment. As such, there are many examples across a variety of media that could be used to support the framework. The reconceptualization of the media viewer is centred on shifting attention from terms like exposure, engagement, and loyalty for media and specific media products to considering the marketplace for attention. This shift is significant in multiple ways. First, so much industry research of the past decade has focused on engagement – which is bewildering since the enhanced options for delivery and choice privilege a much more transient connection than engagement. Webster’s marketplace more accurately reflects our current era: attention is limited, and viewers are stretched between options. This allows Webster to go beyond traditional methods like ‘push’ models in which media is presented to the (passive) viewer, and ‘pull’ models in which viewers actively seek out media for their enjoyment. Throughout the book, Webster highlights how media, viewer, and connection are characterized by reciprocity rather than by a one-dimensional flow. Webster develops his model chapter-by-chapter by building the components in this dynamic relationship. Starting at the level of the media user, Webster succinctly reviews the major theories behind individual media choices and preferences in the academic literature. These strands of thought are complicated considerably when Webster moves to characterizing the digital media environment, especially social networks and their impact on choice. Audaciously, Webster concludes his chapter on the media user by stating, “Preferences are a puzzle and offer a less stable foundation on which to build on than is widely assumed” (47). These simple words speak volumes; conceptions of the media viewer have been woefully inadequate as a means to translate attitudes and perspectives into media choice and usage. Webster seems to be suggesting that we glean what we can from past research, both academic and industrial, but that we must keep an open mind when considering how to understand the digital media experience.This approach is validated as Webster turns to the industrial side of the equation, looking at contemporary media production, whereby the manifold opportunities for individual media creation and co-creation in Web 2.0 render models of media suppliers and passive/active consumers obsolete. Webster develops a quadrant analysis of ‘audience-making strategies’ placing ‘linear/non-linear’ and ‘push/pull’ on the axes. With the goal of understanding audience-building strategies, Webster presents the traditional media equation of advertising-sponsored media (linear/push) and viewer-directed appointment viewing (linear/pull). The digital era extends these options through media-recommender systems (non-linear/push) and user-directed media searching (non-linear/pull). Torpedoing the usual economic structure of advertising-supported media, Webster then considers the issues related to media measurement of the new media environment. In an analysis that would be useful for any empirical investigation of media measurement, Webster details three key biases—behaviour, personalization, popularity—impacting the ways through which measurement is enacted. All of these offer cautionary notes for the ways through which we understand audience both qualitatively and quantitatively. They lead, as Webster suggests, to the ‘end point’ of ‘big data,’ the volumes of behavioural information available for collection on online and digital media usage. Rather than endorse big data as a panacea for media measurement, Webster calls out the myriad problems of relying on big data as a means to interpret preferences, attitudes, and behaviours. He concludes on the efficacy of big data: “Similar to all other media measures, the new metrics are human creations and as such are just as subject to bias and abuse. But their sheer pervasiveness is new, and makes them an increasingly important force to be reckoned with” (94). With the background on the media users, media creation and media measurement in place, the author is in a position to tackle the even more daunting task of how these agents and parameters interact, in other words, how the audience formations are created. Drawing on specific studies from Turner Broadcasting and multiple studies on engagement with local and national news, Webster traces distinctions between preference-driven loyalty (audience loyalties driven by user preferences) and structure-driven loyalty (social structures and program structures such as channels, program schedules, or filtering/recommending systems). Again, he keeps the big picture perfectly clear and visible without sacrificing any of the complexity and challenge of the media question at hand. While the individual studies support both premises, Webster cites his 2012 paper, “The Dynamics of Audience Fragmentation: Public Attention in an Age of Digital Media,” to articulate the gravity of understanding audience formations. Using data from Nielsen’s ‘Convergence Panel,’ Webster and co-author Thomas B. Ksiazek tracked television and Internet usage across 236 ‘nodes’ or networks. This fascinating real-world experiment demonstrated, as did other studies, the fluidity of connection between media sources in our environment. As Webster sums up the current digital era’s audience formation, “The bottom line is there’s very little evidence of a massively parallel culture in the media choices of users. People demonstrate only modest loyalties to genres and political ideologies. They certainly don’t spend their lives barricaded in enclaves of like-minded speech or any other single type of media” (127). Clearly, previous models of audience, usage, and preference fail to account for the current environment, and Webster builds a strong case to that end. He proposes an alternate “comprehensive and dynamic model of the marketplace for attention” in the final chapter. Drawing upon compelling work on structures, both industrial and individual, Webster crafts his model around how media structures organize media use. Rather than adopting a uni-directional flow between media and user, Webster constructs an active relationship between user, media, and the structures between the two. Crucially, in this model, “preferences evolve through the interaction with the media environment” (140). In this conception of the media audience, all parties (user, media, structures) are evolving, shifting, and accommodating to the rapidly changing options available in the environment. The beauty of the model is that it poses a starting point for thinking about the landscape moving forward. The flexibility and openness of the model toward ‘inputs’ to the media environment give it strength –making us reconsider some of our most basic precepts on audience formation in the pre-digital age as well. As with the strongest research projects, Webster’s model inspires a host of questions. It is important to keep in mind, however, that none of these reveal any oversight in the book, and that most are simply ‘thought bubbles’ to be addressed later on. In particular, I am wondering how the micro-levels fall in line with this new model of audience and attention. With the new reciprocity in our digital era between media and viewer, what are the implications regarding the most effective means of distribution or content? Does the model suggest a new advertising exchange (since the traditional broadcast ad model no longer holds to the same effect)? How do multi-tasking and viewer age impact the model? These questions could also be raised on a more global level; in other words, what does the model imply for the new economy and the structure/organization of the media industries? Finally, Webster’s model certainly has implications for content creation too. No doubt, there is a very productive bridge between Webster’s marketplace attention model and the groundbreaking work on digital media texts by Henry Jenkins, Sam Ford, and Joshua Green in Convergence Culture and Spreadable Media: Creating Value and Meaning in a Networked Culture (New York University Press, 2013). In fact, both academic and commercial interests would be well served by supporting a think tank on audience with these authors and such critical thinkers as Jonathan Beller, Jason Mittell, Philip M. Napoli, Alisa Perren, and Denise Mann. Webster identifies up front that his book is designed for three types of readers: academics, those who work in media, and the general public. As a professor returning to the classroom after 15 years of working in the media industries as a market researcher, I am lucky to appreciate all three perspectives. While the book certainly ‘delivers’ to all three constituencies, I am really hoping that it finds a way to reach media producers, marketers, and creative executives, both in the mainstream and independent worlds. In my experience, audience research in the media industries suffers from lethargy, that is, a reliance on qualitative and quantitative market research that has been enacted for years. My hope is that these industry practitioners will use Webster’s comprehensive review and thought-provoking new model of media attention to rethink ways of conceptualizing and connecting with their audiences. Webster’s provocative book suggests, kindly and gently, that we start from scratch with audience conception. Those in the industry would gain from embracing this approach. By doing so, a useful feedback mechanism between media, audience, and industry can be set as a meaningful goal. Justin Wyatt is Assistant Professor of Communication Studies and Film/Media at the University of Rhode Island. From 2000-2015, he worked in primary media research for NBC Universal, ABC TV Network, and Viacom. He holds a Ph.D. in Critical Studies from UCLA. Wyatt is the author of High Concept: Movies and Marketing in Hollywood and the co-editor of American Independent Cinema: From the Margins to the Mainstream.